South Window, Chapel, Claretian Missionaries, Rancho Dominguez, California. The large center section, 43" x 63" depicting St. Anthony Claret with the Blessed Virgin Mary and the section below this, 43" x 21" were completely re-leaded. North Window, Chapel, Claretian Missionaries, Rancho Dominguez, California. The bottom decorative section, 43" x 21" was re-leaded. 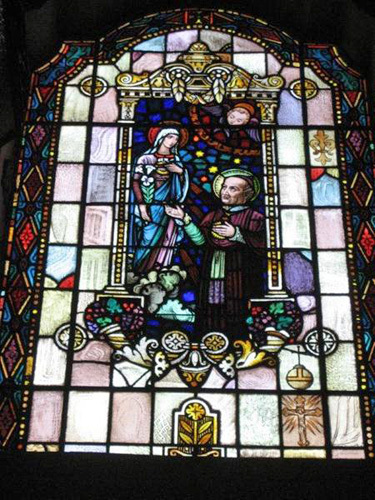 Ancient Arts Stained Glass contact with the Dominguez Seminary dates back to March of 1999. We met the Reverend Donald R. Lavelle at the Religious Education Congress in Anaheim where we were exhibiting our stained glass. Father Lavelle invited us to examine stained glass windows in the chapel that were showing signs of ageing. The chapel is now over 75 years old and although Fr. 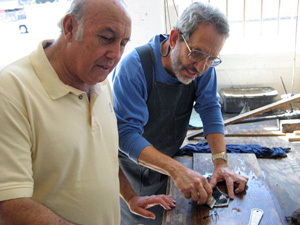 Lavelle was unable to proceed with restoration work at that time, he kept our business card and referred us to the new leaders, Brothers Rene LaPage and Modesto Leon. The Brothers belong to the Sons of the Immaculate Heart of Mary, better known as the Claretian Missionaries after the founder, St. Anthony Claret. Ancient Arts owner Mark Schoem is demonstrating to Br. Modesto Leon how to scrape the old putty off the glass. After disassembly, the stained glass pieces are soaked to soften the old putty. Three sections of the stained glass were significantly bowing and sagging. 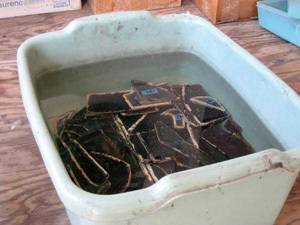 These sections were removed to Ancient Arts Stained Glass Studio in San Pedro for complete re-leading. The original stained glass artisans used six different sizes of lead, an unusually high number. In some areas, the different sizes helped define or emphasize elements of the design; in other areas, different leads were needed to accommodate some unusually thick pieces of stained glass. Identifying and replacing as closely as possible the different lead sizes was one of the most interesting challenges of the work. A few pieces of stained glass that were badly cracked needed to be replaced. These pieces were carefully matched, painted and fired for the closest possible compatibility with the originals. During the months of the restoration, we noticed that many visitors to Ancient Arts Stained Glass Studio were familiar with Rancho Dominguez. They had visited as children during school trips. Rancho Dominguez originated with Spanish land grants in the late 18th century and the Dominguez Adobe dates to the early 1800s. Although still known as Dominguez Seminary, the facility was transformed to a retirement home for Claretian priests after the Seminary closed in 1974. 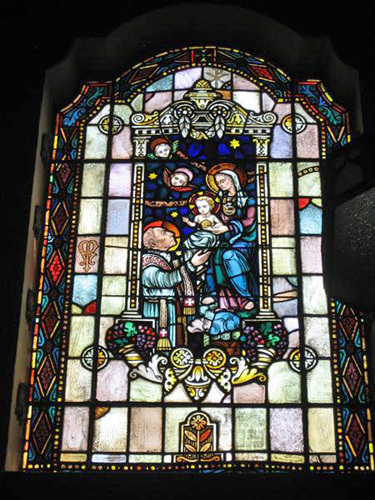 This stained glass restoration project was a worthy effort to ensure the preservation of beautiful and meaningful artwork in a setting that is a significant part of California history. Read more about Rancho Dominguez.